Greeting Cards reproduced in full colour from historical paintings by Graham Turner. 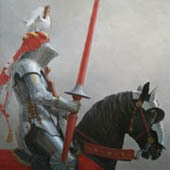 Cards are suitable for any occasion, including birthday, wedding, anniversary, Christmas, congratulations - or as notelets - for anyone interested in medieval history, whether the dramatic spectacle of the joust, the reality of the battlefields of the Wars of the Roses, or more romantic images of medieval ladies and their knights in shining armour. Cards are available individually, in packs of 5, or in two assorted sets. Edward IV leads his army to victory at Tewkesbury, one of the pivotal battles of the Wars of the Roses, fought on 4th May 1471. King Richard III reaches for his lance as Henry Tudor is spotted amongst the enemy host. Sir Percival Thirlwall proudly carries the standard of King Richard III at the Battle of Bosworth. With the wind and driving snow at their backs, the Yorkist archers shoot their final deadly volleys of armour piercing arrows into the advancing Lancastrian army. Richard, Duke of Gloucester, strains to see the enemy through the thick fog at Barnet, on Easter Sunday 1471. Graham Turner's dramatic painting transports the viewer into the thick of the action at the pivotal moment during the Battle of Bosworth, as King Richard III leads his household knights and retainers in a charge towards the challenger for his throne, Henry Tudor. Henry Tudor is crowned on the battlefield at Bosworth. A knight parades in front of a stand full of Ladies before jousting at the tournament held to celebrate the marriage of Richard Duke of York with Anne Mowbray at Westminster in January 1478. The colour and excitement of the late medieval joust are captured in Graham Turner's painting of the Pas d'armes de l'Arbre d'Or - the tournament held in Bruges in 1468. Graham Turner's charming study of a 15th Century carving from the tomb of Alice Chaucer, Duchess of Suffolk (d.1475), at St. Mary's Church, Ewelme. The Earl of Warwick - the 'Kingmaker' - greets the Duke of York in the market place at St. Albans, scene of the first battle of the Wars of the Roses in 1455. Richard, Duke of Gloucester (later to become King Richard III), is greeted by his retainers as he enters the great hall at Middleham castle, accompanied by his wife Anne and their son Edward. As he sets out on a quest, a knight is presented with a favour by his lady. Two assorted sets of cards are available, each containing five different designs.